Are you starting to think about your spring travel plans? It is almost March, so warmer temperatures are hopefully right around the corner. You’re ready to put your snow gear in storage, pull out your lightweight clothing, and go watch the flowers bloom. France sounds nice. You could eat fromage and drink lots of wine. But it’s been years since you’ve been to England. Decisions, decisions. A compromise? The Channel Islands are a self-governing group of British islands right off the coast of France. Their strategic location sounds problematic, and for centuries, it was. The two countries invaded, occupied, and claimed the eight islands as their own many times over. Forts still littering the islands prove this. Then the Germans seized them during World War II. France and England united to win the war; the Channel Islands have been peaceful ever since. You’re heading to Alderney. Located only 10 miles west of La Hague, in Normandy, it’s the closest island to France. It’s the northernmost of the Channel Islands, and at 3.5 miles by 1.5 miles, it’s also the third largest of the islands. It’s full of windswept beaches, Victorian fortifications, German bunkers, a large gannet colony, and friendly people. Walking trails outnumber paved roads. The speed limit maxes out at 35 miles per hour. And the massive police force has three officers. Alderney is a quiet, peaceful retreat. 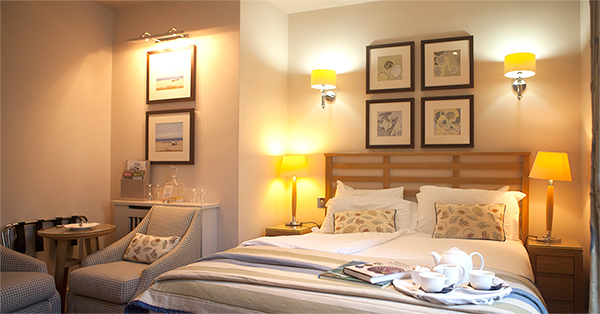 You should feel right at home at the Braye Beach Hotel. Overlooking Braye Beach, the hotel has light, summery rooms; comfy sitting areas; and delicious, seasonal food in the restaurant. Mornings start with coffee on the terrace as the sun rises. A full Alderney breakfast—including Kiln Farm bacon and pork sausage, black pudding, tomatoes and field mushrooms, and a poached egg—will prepare you for a full day ahead. Spend the morning bird watching. At Les Etacs, a rocky outcrop on the southwest coast, 5,000 gannets live and breed. Puffins call Hannaine Bay home this time of year. And migrant birds are flying north after a long winter. Explore the old forts: Gronnez, Doyle, and Clonque. Walk along one of the beautiful beaches. Saye Beach is a sunny spot protected by sand dunes. Longis Bay has rock pools at low tide. And rough Corblets Beach attracts the surfers. Locals may swim throughout the year, but it’s still a bit chilly for you. Instead, stroll through St. Anne—the island’s only town—to see St. Anne’s Church, drink a pint at Jack’s Brasserie, and browse the tiny shops. Tomorrow, you’ll join a group to go foraging for stinking onions, wild carrots, and nettles. Maybe you’ll take a boat trip to see nearby islands, shipwreck locations, and seals. And you don’t want to miss the Alderney Society Museum to see artifacts from those wrecks and the German occupation. But first, a seafood dinner at Rosette. Chili-and-ginger lobster bisque, freshly caught fish, and the first rosé of the season are the perfect way to welcome spring.